[Note: Shanghai Social Club has closed its doors, at least for the time being. I understand they'll reopen next year, with the same management but a "new concept."] Taking the Green Line to Allston from downtown Boston during afternoon rush hour is an exercise that would test the patience of a saint. The jerky motion and countless stops and starts can make a ride on the B branch feel like an ill-advised sailing trip on rocky seas. And that’s to say nothing of the uncomfortably close quarters – nearly 220,000 commuters squeeze into the trolleys every day, making the Green Line the busiest mode of public transportation in Boston. It can get worse, too – if the Red Sox are in town, the game-day crowd will increase your troubles tenfold. Disembarking at the intersection of Harvard and Commonwealth would seem like a relief, but even that is not without its frustrations. Exiting the T into the gritty, densely populated neighborhood of Allston means navigating sidewalks crammed with pedestrians and streets gridlocked with cars, buses, and cabs. A perpetually busy neighborhood known for its large student population and concentration of bars and restaurants, Allston is not without its charms. But if you’re seeking a quiet refuge, it’s probably not at the top of your list. And that’s the first thing that makes Shanghai Social Club so very un-Allston-like. Even before you peruse the impressive drink list, the first thing you notice is the absence of chaos. A different realm indeed. While modeling itself after “the social clubs and bars of the Bund area of Shanghai,” the calm, dimly lit setting of Shanghai Social Club fuses disparate elements from multiple eras of Asian history and culture, all filtered through an American lens that is at once kitschy and sincere. The walls are plastered with images of Chinese newspapers and vintage communist propaganda posters. Birdcages and statuettes appear to be straight out of a Chinese street market. 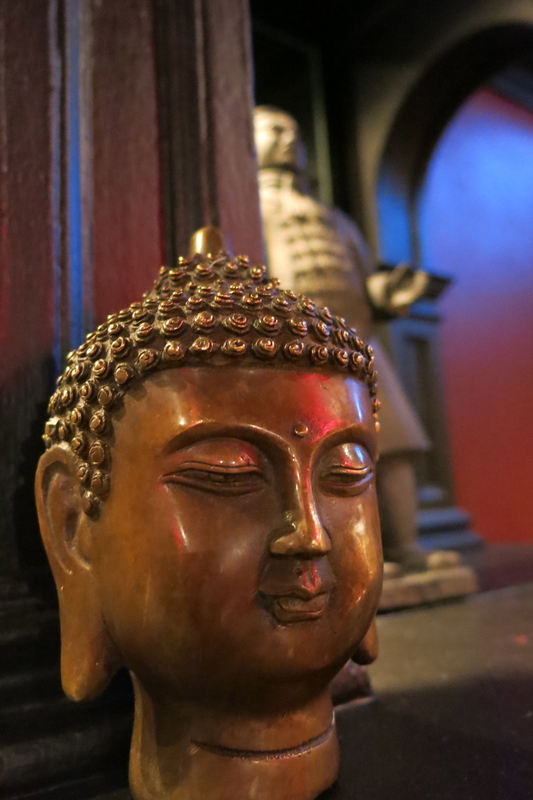 Candles and hanging red lanterns cast a soft glow on the Buddha statues of varying sizes that reside throughout the restaurant. The space is surprisingly large, but smartly compartmentalized into four dining rooms, each of which feels cozy and distinct. In the main room, a long, marble-topped bar is surrounded by about 15 chairs, while a few long tables round out the bar area. And in the center of it all, a comfortable lounge evokes the shadowy atmosphere of an Old Shanghai opium den, with leather sofas and soft throw pillows. No one’s chasing the dragon here (presumably), but it’s perfect for conversation over potent drinks. And there are plenty of those. Shanghai Social Club’s cocktail menu pays homage to old-school tiki styles while offering a few inventive house cocktails that stand up to the classics. And whereas so many Chinese restaurants offer a colorful array of cloyingly sweet Polynesian libations, Shanghai aims for substance and authenticity. 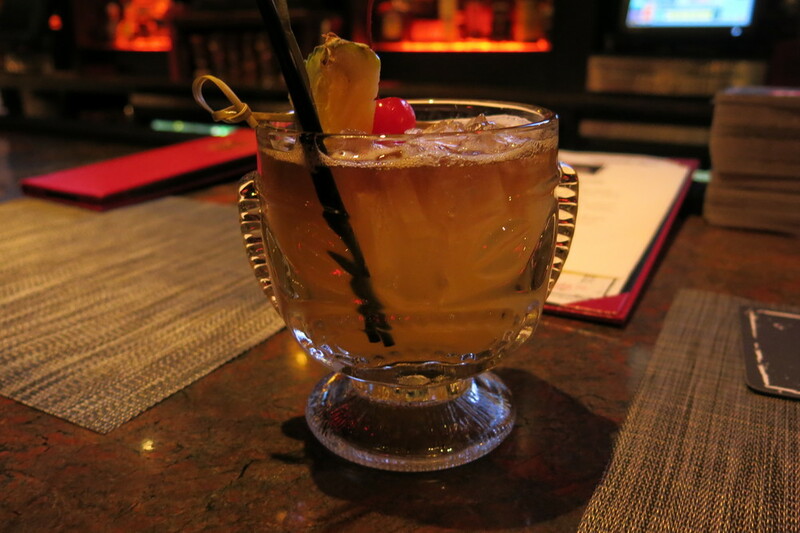 “That’s the 1940s Trader Vic’s recipe,” Farish says of the Mai Tai. Made with Flor de Cana Grand Reserve rum, Rhum Barbancourt, Cointreau, orgeat syrup, and lime juice, this traditional interpretation is refreshingly dry and not loaded with sugary fillers. 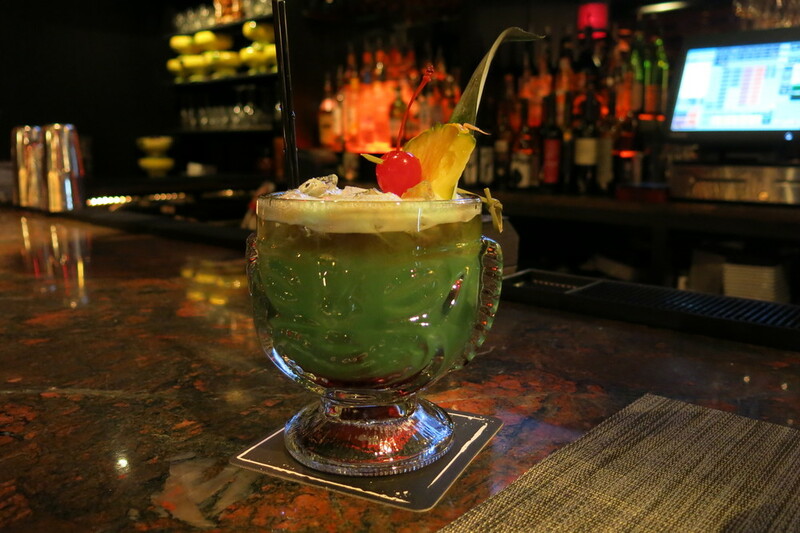 Like the Mai Tai, the Zombie stays true to its roots. Made with Appleton Estate Reserve rum, Brugal Extra Dry rum, orange curacao, lemon juice, grenadine, and a touch of Pernod, it’s a boozy, full-bodied cocktail with an unexpected dryness. Sweeter and smoother, but still potent, is the Painkiller. This faithful rendering of a tropical classic combines Pusser’s Navy Rum, pineapple juice, orange juice, coconut cream, cinnamon, and nutmeg. Shanghai’s adherence to traditional recipes for its tiki drinks is refreshing, but not restrictive. The traditional Mai Tai is joined by three colorful variations – blue, white, and orange. Each offers a subtle twist on the classic, like the coconut rum and blue curacao in the Blue Mai Tai. Bu there’s more to the drink list than rum and Caribbean syrups. Mixing tiki influence with some Mexican inspiration, the smoky Mayahuel combines mezcal, Kahlua, orgeat syrup, and pineapple juice. The mezcal is prominent in this smoke-forward drink, but a rich, back-end sweetness makes for a smooth, complex cocktail. Foo Dogs Barking (ordered, ironically, by my friend Kat) combines Bulleit bourbon with lime juice, falernum, and Angostura bitters. 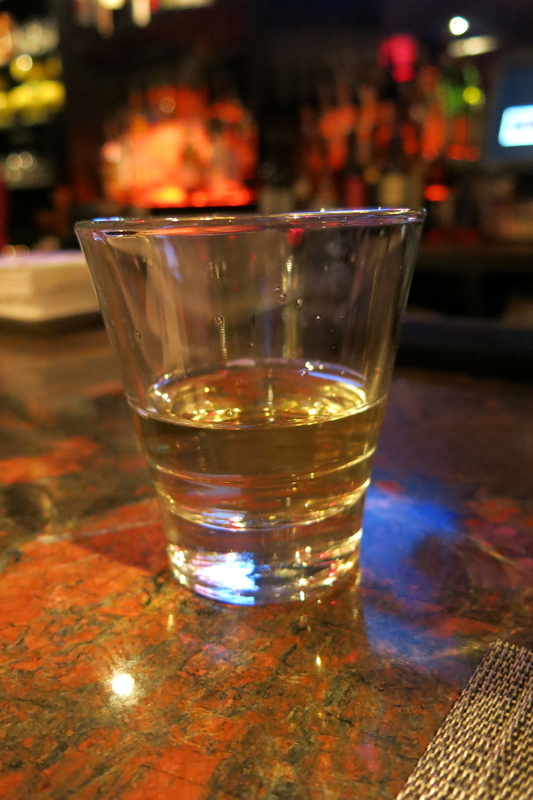 The Mano Negra is tart, with a prominent, well-rounded spiciness. Made with aged rum, lemon, falernum, and passion fruit syrup, what puts this one over the top is Aphrodite bitters, which add notes of chocolate, red chili, and ginger. Now there’s plenty of history and debate behind the origins of tiki drinks and how they became mainstays of American Chinese restaurants. But when it comes to cuisine, we all know there’s little room for argument – a veritable gulf exists between Americanized Chinese food and actual Chinese food. From ingredients to seasonings to presentation, most American Chinese restaurants serve food that bears little resemblance to genuine Chinese dishes. And most of us are totally fine with that – “classics” like beef with broccoli and General Gau’s chicken may not have originated in China, but who would pass up the tastiest and guiltiest of culinary pleasures in the name of authenticity? Not I, and certainly not Shanghai Social Club. Shanghai unapologetically embraces a menu of Americanized Chinese food, including its epic centerpiece – the pu pu platter. Emanating from the fiery pot in the center of the platter are all the staples: crispy egg rolls with a peppery kick, chicken wings that pack a spicy punch, teriyaki beef, boneless and bone-in spare ribs. In terms of variety and quality, it’s pretty average; but like any pu pu platter, it sure hits the spot. Such dishes may have little in common with traditional Chinese cooking, but Shanghai manages to elevate even the most Americanized of faux-Asian delights. The crab rangoons are made with real crab and – unlike the standard variety – contain more crab than cream cheese. And an insistence on using fresh ingredients gives all of Shanghai’s dishes a unique touch. “We make our own Sriracha sauce,” Farish tells me, adding that “we only call it ‘Sriracha’ so people will know what it’s like. It’s freshly made daily.” The same goes for their sweet, thick duck sauce, which accompanies a bowl of crunchy wonton strips. What’s more, not all of the Chinese dishes on Shanghai’s menu would prompt an eye roll from an actual Chinese person. There’s a selection of steaming noodle bowls that seem closer to the real thing. The firecracker short ribs option is served in a piping hot broth, with rich, thick noodles and fork-tender meat. Given the incendiary title, I was anticipating something overly spicy; instead the heat is well balanced and not overpowering. The partially cooked egg resting atop the noodles was a surprise, but the bartender, Nicole, instructed me to stir it in, explaining that the heat of the broth would finish cooking the egg and thicken the broth. I don’t know where steamed buns fall on the spectrum of Chinese authenticity, but they’re truly the highlight of Shanghai Social Club’s menu. Three soft, doughy buns are filled with your choice of meat; Nicole recommended the hoisin scallion duck. Phenomenal. Of course, no evening of drinks at a Chinese restaurant would be complete without ordering the most conspicuous and quintessential of Polynesian libations – the Scorpion Bowl. There’s always something special about getting this communal cocktail. When you agree to share a Scorpion Bowl with someone, you’re making an unspoken pact – Yes, we’re getting drunk tonight. Of course, you’re also committing to a wretched case of gut rot. Most Scorpion Bowls do pack a boozy punch, but the abundance of sugary mixers will surely come back to haunt you. But again, Shanghai surprises. For starters, the ingredients are simple: rum, brandy, orgeat syrup, and juices. And Shanghai’s freshly squeezed juices mean the Scorpion Bowl isn’t cloyingly sweet, and you can appreciate the natural flavors of the fruits and spirits. It’s still served in the customary ceramic volcano bowl, though, with a flaming shot of Bacardi 151 in the center. “You can let it burn off, or just blow it out and drink it,” Nicole told us. For decades, 1277 Commonwealth Ave was occupied by Our House. Divey, humble, quirky, and oddly lovable, Our House was the very definition of an Allston bar. Cheap beer, threadbare couches, and a selection of faded board games made it feel as much like a college student’s living room as it did a bar. With its purposeful design and peaceful aura, Shanghai Social Club could not be more unlike its beloved former tenant. And the bar’s cocktail program stands in sharp relief to the many beer-heavy bars that still populate Allston. Ranging from $9 to $11, the drinks are in line with most Boston prices but not out of the grasp of the student population. 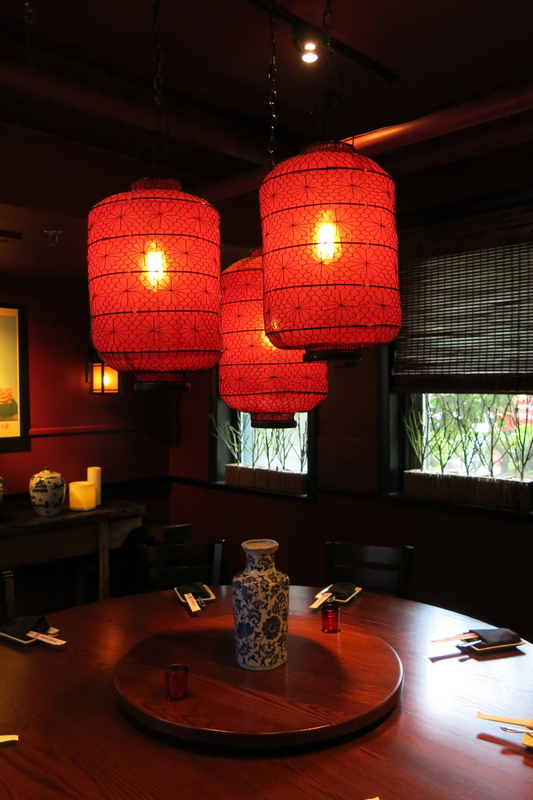 General manager Farish Jenkins tells me that many of the drinks were deliberately chosen to complement the food menu – no easy feat, given the many spices in Chinese cuisine (Americanized or not). There’s still beer, of course. A few hearty local brews appear in the draft offerings, along with lighter fare that always works well with a pu pu platter and pork fried rice. Farish even offers me a sample of a hard-to-find pineapple hard cider made by Ace, a California brewery. “It would have gone well with your soup,” he laments. But beer aside, what distinguishes Shanghai Social Club from its neighborhood peers is its cocktail program. You can find cheap, imitation tiki drinks anywhere. But the real thing is even worth a ride on the Green Line.